3 star DB on 247Sports, 4 star on Rivals that took an OV to Indiana September 7th is announcing his decision at 2pm. IU has taken a huge lead in the Crystal Ball today. Tiawan has committed to the Hoosiers! Mullen is the second highest rated recruit in Indiana's 2019 class and takes the Hoosiers up 1 spot to #48 nationally. Looks like he had quite a few offers. 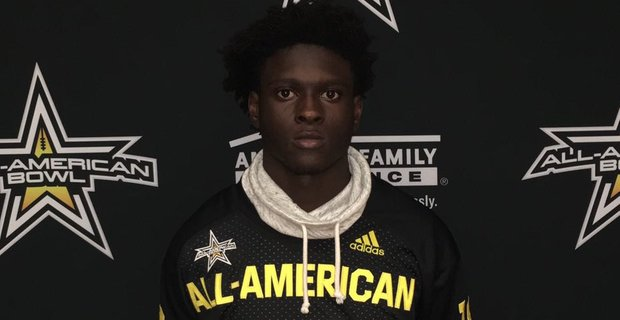 Mullen makes it two straight years of an Army All American Bowl player committing to the Hoosiers (Charles Campbell) and is the third Indiana commit or signee to appear in the annual showcase game. My thanks to Matt Weaver for not putting this behind a paywall. Any time we can get a kid from Florida is fine with me. I love this Mullens commit! However, it is so funny how some of these commits who are not from the midwest continue to call IU, University of Indiana!!! Kansas has everybody screwed up? Solid get for you guys. Absolutely mucking good news indeed !! Go Hoosiers ! Was presented his All-American Bowl Jersey yesterday. Thought people would like to know he's been matched up against the #1 WR in country in practice most of today and holding every bit of his own. Been very impressive all week. Even though Mullen got beat for 2 touchdowns, I really think he's going to be a hell of a player for us. On both of those plays, he had really good position, just didn't make the play against the #2 WR in the country. Once he gets stronger and more experienced he'll break those up. I can't wait to see him in a Hoosier uniform next year! I think he's one of the most underrated recruits we've had in a while. I think he's going to be tough to keep off the field. He's the recruit I'm most excited about seeing play. That looked like Michael Johnson in the '96 Olympics. That's my boy! That's my boy!